Whenever someone enters the world of ecommerce and dropshipping, besides choosing their store name and working on brand, the biggest obstacle is finding trending products to sell. The last thing you want to do is try to peddle yesterday's old products that have pretty much fizzled away and no one is searching for anymore. An great example of this would be fidget spinners. If you hopped on this trend in its infancy, you could have made a fortune like a lot of marketers did. Knowing how to spot trends can make you a lot of money in ecommerce and that is exactly what my blog post today is going to be about. So pay attention and take notes or just bookmark this page for future reference. Before we get into the methods, there's just something I want to make you understand when it comes to products. Just because you find something that YOU like, it doesn't mean it's going to sell. I don't care how much you think it's a great product. If your audience doesn't like it, it will NEVER sell no matter how much money you throw at it. Don't do that! You need to find products that others will like - not necessarily you. So if you spot a trend that you have reservations about or perhaps you don't like the product, you're doing yourself a disservice if you pass it up. It's worth testing if everything checks out. With that being said, let's dive into the methods. This tool is particularly useful if you have spotted a product somewhere else and want to gauge its popularity. To use it, just go to trends.google.com and enter in the product name in the search bar. As you can see, this would be a terrible product to try and sell now. It's popularity started to fizzle at it's peak at the end of April 2017. It still gets some searches but the trend has come and gone already. So use this tool to your advantage. If you see the product in the chart moving upwards, it's probably something you should consider. If you start to see the decline, you can still get some sales but know that the product will eventually fizzle and die out so you better pay attention to your ad spend! You can also click on "more trending searches" at the bottom of the tool to find what's currently trending. You never know what might come up. More and more marketers in the Ecommerce space are using Influencers nowadays. You don't need to follow top influencers like Kylie Jenner to find products, it's the smaller influencers with maybe 30,000+ followers to check out. 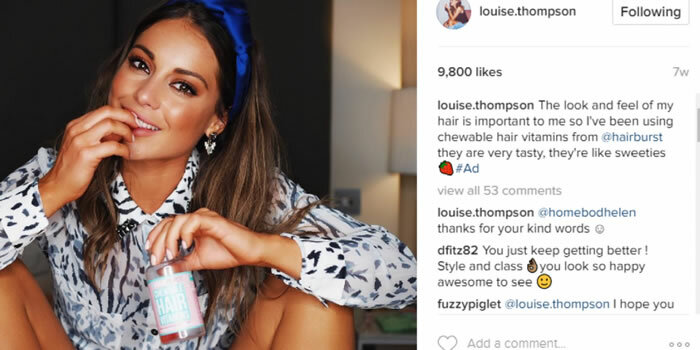 If you start spotting trends with a bunch of influencers (especially on Instagram) posting the same product - it could be a winner. There are tools on the market to find influencers in a particular niche but I would just do this manually. It will take time but after a while you're going to uncover a lot influencers and possibly your next golden ticket. Reading blogs on trend reports with custom research and consumer insights can really be a game changer for you. Sites like these will write about new innovations in many different niches from automotive to tech and apparel. This will take some time and research on your part but you could end up spotting the next big trend with this resource and just hit it out of the park. Keep in mind when using these sites you aren't going to get a list of products that are trending, but what you will get in an insight into a trending market. Just follow the breadcrumbs and you'll end up finding your golden nugget. These are pretty general but I think you get the idea. You'll be able to niche down by doing a more specific search. 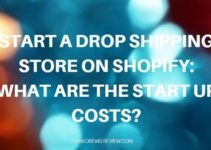 I can almost guarantee you know about this one already if you're interested in setting up a dropshipping store on Shopify. 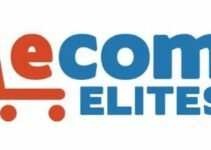 If you are not familiar with AliExpress, this marketplace is the top resource that dropshippers use to sell items on their Ecom Store. 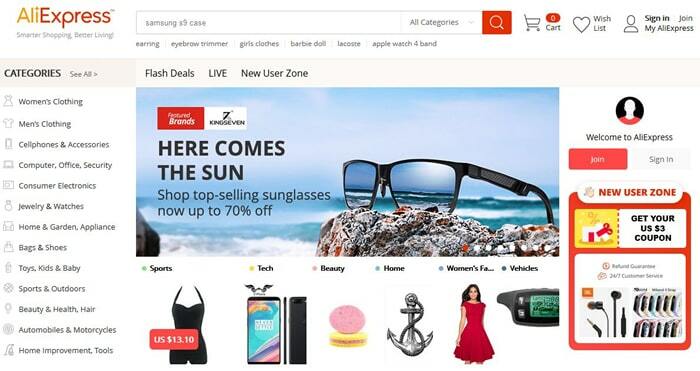 AliExpress has a wide range of different categories and merchandise ranging from men & women's clothing, beauty, tech, toys, holiday items and so on. You can also see what is selling well in their "best sellers" list. This is a great way to find products because the research is almost done for you already. If the product is selling well, you already know there is demand and people are buying. Keep in mind though that just because a product is selling well in the weekly best sellers list on AliExpress, it does not mean that you are going to do well. You need to test, test, test! This is a paid tool but they do allow you some free searches with a free trial version. If you're going to buy it, it will set you back $79 a month. Give the trial a go to see if it's something for you before you drop money on it. Buzz Sumo will enable you to see what the best performing products are within social sites like Facebook, Pinterest, Twitter and LinkedIn. With this info you'll be able to identify a potential trend popularity in your niche. This tool will also enable you to find an influencer, so it can be very valuable in this regard as well. Simply enter the name of your product or the niche in the search bar of Buzz Sumo. It will then generate articles that are trending in that niche. Filters are available too, so you can choose your type of content, with either videos, infographics, interviews and more. Buzz Sumo is targeted towards the more serious marketer who really wants to drill down niche research to the most absolute level. A consumer market place is simply an online store that sells directly to the public. Stores like Amazon, Ebay, AliExpress and Etsy are all examples to get product research and ideas from. To find products, just check out their trending pages to see what people are buying. You might just find a gem that is selling like hotcakes that you can find elsewhere to offer on your dropshipping store. Commerce Inspector is a free and a paid tool that basically "spies" on stores. You'll be able to uncover data from your competition to see what their top products and trends are. The free plugin allows you to get product insights, traffic sources, apps, social links and the best selling products on any store. With the paid version you get more data like revenue at both the product and store level, the previous week's bestsellers and a list of the top-selling and trending store lists. It's a valuable tool and with the paid version at $49 per month it's worth looking into. You are limited to data on 3 stores though. The Enterprise package is $499 a month which allows you to get data on unlimited stores. You'll be able to get a lot of insight into trending merchandise by simply visiting social curation sites like Pinterest, Instagram, Wanelo or Fancy. Pay attention to the interaction with the photos posted. For example on Instagram, if you're seeing a lot of likes and comments on a cool product, it's going to be worth looking into. The same goes for Pinterest and other similar sites. Check them all. This strategy is very powerful. Not only are you going to see what the top selling Shopify stores look like (so you can get inspiration) but you're going to see what they are selling. When you think of this logically, these top visited Shopify stores are not going to waste the traffic they have with poor performing products. They've probably invested thousands of dollars testing them. So if you know what the top selling stores are, you can be sure to find some products to do more research and finally test them out. There are some steps involved to find these stores which I will list below. Step #2 - Enter this IP address 23.227.38.32 and then click "Whois Lookup"
Step #3 - Click on "Other Sites on IP"
Step #4 - View the list and click on "View All Records" to get more results. After clicking "Other Sites on IP" you'll see all the top performing Shopify stores. Remember there's a TON of them as this is the IP where Shopify hosts all their sites. 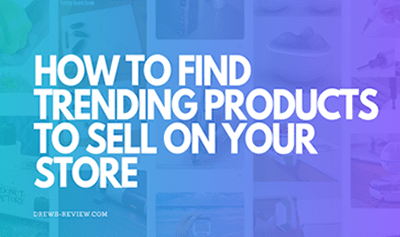 I hope you got some good ideas on how to find some winning products to sell on your store. With a little work you will be able to spot trends and get in the game before the majority of other dropshippers. Once you get good at it, you'll find which method works for you but I encourage you to test them all. With all this knowledge you have on finding trending products now, it's completely useless if you don't know how to properly set up your store, do your sales copy, create a brand and the biggest one - creating your ads. My advice to you is to enroll in an Ecommerce/Dropshipping course which will enable you to accelerate your growth much quicker and avoid costly mistakes of going at it on your own. Your instructor will also discuss ways in which to find products as well. A lot of these strategies won't be found for free either, so a good course will also assist you with product research. 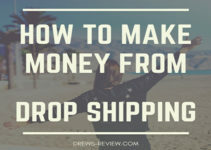 Take a look at my Top Dropshipping Courses for 2019 list. I have separate reviews for them all and they start at just $197. That's a drop in the bucket for what you can make with ecommerce. It's crtical that you invest in your education and my recommendations come from top marketers in the ecommerce space that not just teach it, but actually do this stuff and make a killing with it.